It was one of the biggest rallies ever held before UN in Geneva. "On Friday, November 01, U.S.-based Sikhs for Justice (SFJ) along with Movement Against Atrocities and Repressions (MAR), AISSF and with the support of Gurudwara management committees from across Europe, submitted a (million-signature) petition to the UN human rights office." said Surinder Singh, an organiser . "Our orgainizers also held talks with officials to seek an international investigation into the November 1984 killing of Sikhs and UN's recognition of the killings as 'genocide' under Article 2 of the U.N. Convention on Genocide. According to the local news paper and TV station, the Organisers had mustered 4000-8000 sikhs from Europe, North America, India, Hong Kong and Australia. The delegation included SFJ legal advisor Gurpatwant Singh Pannun, SFJ Coordinator Avtar Singh Pannun, Harminder Singh Khalsa of MAR, Doctor Karj Singh Dharamsinghwala of AISSF, Jatinder Singh Grewal of SFJ and Jasbir Singh Delhi. November 01 rally before UN was one of the biggest rallies ever held before UN in Geneva. The petition stresses that successive governments in India have deliberately misled the world community into believing that the 1984 killings were 'riots' confined to Delhi, when "there is ample evidence to the contrary". The petition titled, '1984: Yes, it's genocide' was filed under 5/1 complaint procedure of the Human Rights Council and carries 10 lakh signatures from Sikhs across the world. The campaign to file the petition and collect the signatures was spearheaded by the SFJ, several other Sikh human rights NGOs, as well as management committees of Sikh gurudwaras across Europe, America and Canada. SFJ coordinators Avtar Singh Pannun of New York and Sukhwinder Singh Thana worked tirelessly past several weeks to organize the rally and toured the UK and Europe to gather support from the local Sikh community. 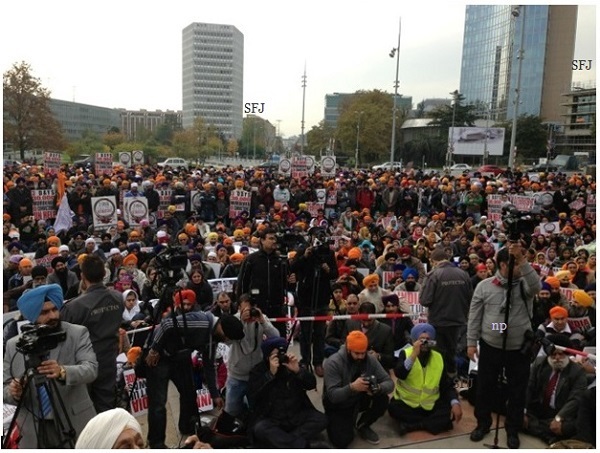 Doctor Bakhshish Singh Sandhu, SFJ Coordinator also travelled to Geneva to attend the rally. Jasbir Singh Delhi a resident of California, who is main witness against Congress leader Tytler also travelled across Europe to gather community support for the Genocide petition and rally before UN. According to Jasbir Singh Delhi, the victims of November 1984 have approached United Nations for justice because all the attempts to obtain justice in India have failed and organizers of November 1984 are rewarded by India instead of being prosecuted. Addressing the rally, SFJ Coordinator, Avtar Singh Pannun stated that for past 29 years Sikh community has been demanding justice for India's crimes of November 1984. Now we have approached the UN and global community for recognition of November 1984 Sikh Genocide. According to Sukhwinder Singh Thana, SFJ Coordinator, Sikh community have come together in demanding justice and UN intervention on the issue of November 1984 Sikh Genocide. Doctor Bakhshish Singh Sandhu of SFJ stated that filing petition before the UN on the issue of November 1984 is just the first step in seeking justice and recognition for Sikh Genocide. With the help and support of Sikh community worldwide, we will have take the matter to all international forums. Tejinder Kaur from Surrey, Canada, travelled all the way to Geneva for submission of the petition and to participate in the rally. She also addressed the rally, saying: "I was just 13 years old when this massacre took place and daughter of a senior Indian government official. That was the moment in my life, to discover my identity as a Sikh." The petition was also supported by the Akal Takht, the supreme temporal body for Sikhs, which issued an appeal to Sikhs to gather signatures and make it a success. Camps were held in the five Sikh takhts and at several gurudwaras along with awareness campaigns across social media to collect signatures. Almost three decades after more than 30,000 Sikhs were massacred in India during November 1984, U.S.-based Sikhs for Justice (SFJ), Movement Against Atrocities and Repressions (MAR) and All India Sikhs Students Federation (AISSF) filed a petition before the United Nations Human Rights Council in Geneva seeking an international investigation into the November 1984 killing of Sikhs and UN's recognition of the killings as 'genocide' under Article 2 of the U.N. Convention on Genocide. The petition provides "new evidence" aimed at proving that contrary to prevalent belief, the killings of Sikhs had spread to 18 States and 100 cities beyond Delhi. This includes, among other things, official government records that state that 35,000 Sikhs claimed damages for death and injury, out of which 20,000 claims are from Sikhs who were attacked outside Delhi. Further, the Sikh groups have provided new evidence of the existence of mass graves of 65 Sikhs in Hondh Chillar village of Haryana, discovered in February 2011, a mass cremation site at Pataudi in Haryana, and ruins of Sikh houses and gurudwaras in Gurgaon and West Bengal. The petition states, "As a planned cover-up, remains of all such sites were cleaned and rebuilt to purge traces of the attacks. The debris and human remains at the newly discovered genocidal sites throughout India as well as the official records of the Indian government are the most specific irrefutable and convincing evidence that killing of Sikhs in November 1984 was 'genocide'. The new evidence justifies new investigation." Stating that Sikhs have exhausted all avenues in seeking justice and redress in India, the Sikh organisations have detailed the 29-year saga of 10 commissions of enquiry into the killings that led nowhere, the relief given by courts to the accused Congress leaders, and the manner in which the Congress party has promoted and given them tickets despite the charges they face. Describing the commissions of enquiry as "eyewash to offset the demands for justice and accountability," the petition says that a cursory look at the reports and recommendations of the commissions shows that they are a "hoax played through the façade of investigation into the November 1984 killings" and were aimed at covering up the extent and scale of violence against the Sikhs. Naming the former MPs, Sajjan Kumar and Jagdish Tytler, Union Minister Kamal Nath, Arjun Singh, HKL Bhagat and Amitabh Bacchan, among others, the petition says the government has "thwarted all attempts by the victims to get justice by cover-ups, destroying evidence and providing immunity to Congress leaders, by threatening witnesses and victims. The victims have no recourse but to approach the UNHRC."